As a parent, it feels like I haven’t gotten a complete night’s sleep since before I had our oldest… that was 6 years ago. Needless to say, we try to keep our room and bed as comfortable and relaxing as possible to savor the nights of sleep that we do get. 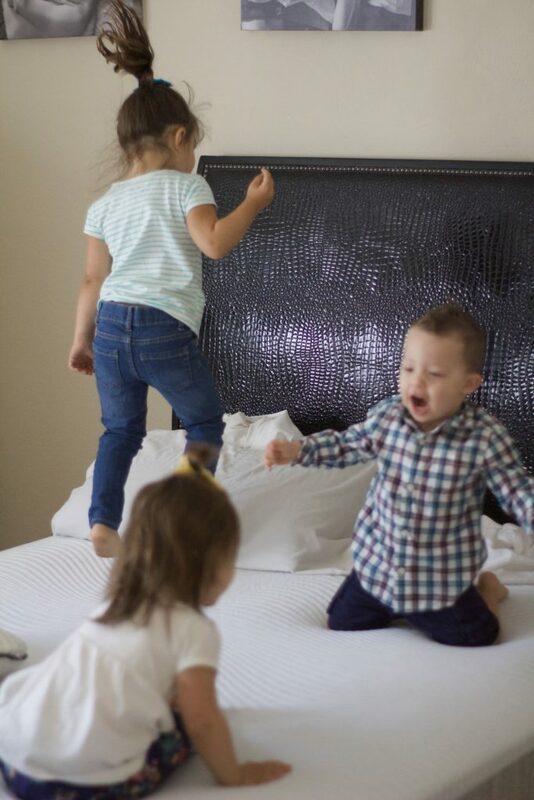 So, in honor of parents everywhere not getting enough sleep, I am sharing my top tips for getting sleep, in partnership with Tomorrow Sleep mattress. *This post was in partnership with Tomorrow Sleep. All opinions and thoughts on the products in this post are my own and, as always, 100% honest. Thank you for your continued support of Motherhood and Merlot. Have a set bedtime routine: Every night, I pretty much do the exact same thing before going to bed. Walk through a pick up the house so that it is clean for 10 minutes in the morning before my kids wake up. Wash my face and brush/whiten my teeth. Read for a little while or catch up on television show. Chat with my husband. Go to sleep. Because I am on such a routine schedule, starting at 5 am when I get up for the gym, bedtime has to be equally as routine. That helps to prevent my feeling like I am forgetting to do something when I am laying in bed trying to get to sleep. Get to bed at a decent hour. Yes, I know that the hours late at night, when the house is quiet and everyone is sleeping, are ideal for working and getting the things done during the day that you couldn’t when the kids were awake. But, they are still going to wake up at their normal time, regardless of when you get up. Making sure that you get to sleep at a certain time will help ensure you are getting at least the bare minimum in sleeping hours. Try not to nap. As someone who hasn’t had more than a handful of naps in years, I know that when I do, it has to be early in the day or I will not be able to get any sleep that night. Once your internal clock gets on a schedule, things like naps really throw it off, which in turn makes you feel like you can’t fall asleep for hours after you actually want to. Exercise at some point throughout the day: Even if it’s just a walk after dinner, exercise and moving your body will help you rest better when it is time to go to bed. Read more tips for starting a new exercise plan here. Find a good sleep system: mattress, pillows, bed set, etc... Having a good bed set-up is crucial to getting a good night’s sleep. You might have to share that set-up half of the time, when you have little ones crawling in your bed at night, but it is worth it to get those treasured hours of fantastic sleep. Tomorrow Sleep has an amazing sleep system that was made to combine memory-foam with supportive coils that allow a breathable mattress and comfortable nights sleep. The material makes it easy to get in and out of bed without waking your significant other, or your children if they happened to take over your sleeping space that evening. We have been getting a great nights sleep on their medium-firm matters and pillow set. The pillows are one of my favorite items because they are made of memory foam, so you can sleep on one for a supportive yet comfortable sleep, or you can stack them if you like a little bit more lift. I am a flat sleeper, so just one of their Memory Foam Bed Pillows does the trick for me. Plus, one side of the pillow always stays cool because of the material and the way that it is made. Who doesn’t love the cool side of the pillow? If you are in need of a good night’s rest, check out Tomorrow Sleep for some amazing products, and use the code MERLOT100 for $100 your order of $500 or more. 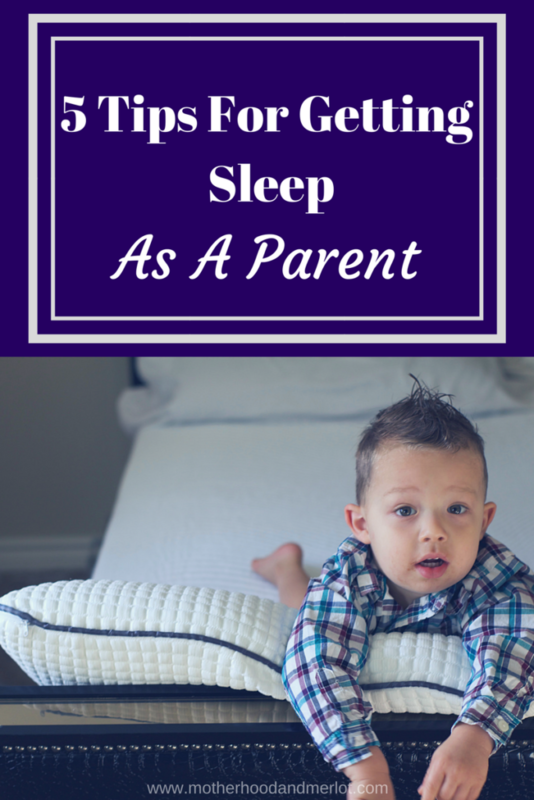 What are you favorite tips for getting sleep as a parent? We’re looking for mattresses right now for when we do the crib to bed transition for Casey. I’ll keep this one on my list! Favorite tip for getting sleep as a parent: Make the husband get the baby 😉 Kidding!! This mattress sounds amazing though. Do they ship to Hawaii? 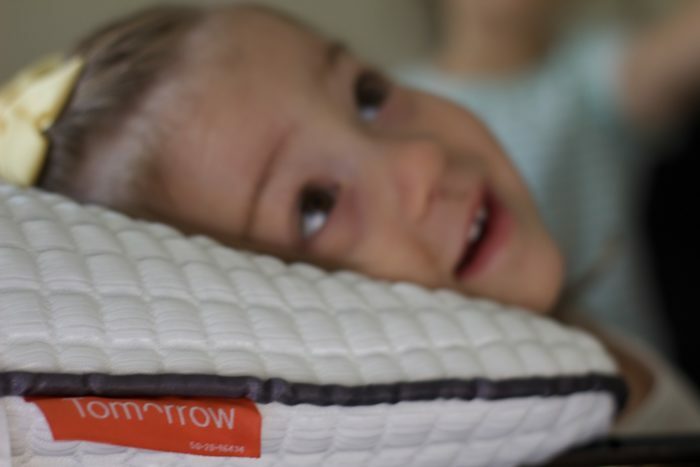 We love our Tomorrow Sleep mattress! It has really helped me a lot to get more sleep at night! I totally need to get better at the exercise, but I’m doing good at the other stuff! Great tips! I need to work on number 2 but after the baby is asleep I just want to get things done, and then I stay up too late! I disagree on naps. Science says we actually need naps, but they need to be short, no longer than an hour and a half I believe is what they recommend. I actually could use more naps! I’m also a Stay Home Mom though, so I think just having to take care of a baby all day wears you out a lot more. I try to nap when the baby naps, but that’s also the perfect time to get stuff done too! YES! Exercise helps sooo much! I need these tips & Sleep!! Great tips! I never knew how much I would miss sleep until I had kids! Find a routine and stick to it. It’s the one thing that has helped us time and time again.